MONTREAL, QUEBEC--(Marketwired - Jan. 26, 2017) - PyroGenesis Canada Inc. (http://pyrogenesis.com) (TSX VENTURE:PYR) (OTCQB:PYRNF), a clean-tech company (the "Company" or "PyroGenesis") that designs, develops, manufactures and commercializes plasma waste-to-energy systems and plasma torch products, announces today that it has submitted a report to its client, HPQ Silicon Resources Inc. ("HPQ"), entitled "Update on the PUREVAP™ Process Characterization Testing Phase", which reviews the results of 36 tests completed to date at a lab scale level. A further 14 tests remain to be completed and such is expected to be done by the end of February 2017. The findings in this report are significant in that they demonstrate the scalability of the process of converting low purity quartz feedstock into a high purity silicon metal in both a repeatable and predictable manner. "We are very satisfied with the results so far," said Pierre Carabin, Chief Technology Officer of PyroGenesis. "Our ability to increase capacity by a factor of nearly one hundred times in such a short time frame gives us great confidence when it comes to scaling up to the 200 TPY pilot plant." In August 2016, PyroGenesis announced that it had signed a contract for CAN$8,260,000 with HPQ to provide a 200 metric tonne (MT) per year PUREVAP™ pilot system to produce silicon metal directly from quartz (the "Contract"). This Contract is for the design, fabrication, assembly, commissioning and testing of a 200 MT per year PUREVAP™ pilot system (the "System"). This Contract was awarded as a result of PyroGenesis' successful demonstration in February 2016, on a laboratory scale, that the one-step proprietary PUREVAP™ process could produce high purity silicon metal from quartz in just one step. The PUREVAP™ process is a process being developed by PyroGenesis in which quartz is transformed into a solar grade metal suitable for solar panel applications, in one-step, which effectively eliminates significant overheads thereby creating a simple, pure and cheap alternate to that currently available. During "Phase 1 - Proof-of-Concept Metallurgical Tests" ("Phase 1"), which was comprised of 15 tests, the following milestones were confirmed: (1) the PUREVAP™ process is capable of producing high purity silicon metal; and (2) the PUREVAP™ process can remove boron and other key impurities from the final material produced, the latter of which was considered a major hurdle to transforming quartz into silicon metal. Phase 2 of testing was geared towards generating and collecting data which could be used for the commercial scale-up of the PUREVAP™ process ("Phase 2"), and it is the phase in which we are currently in. While generating this data, improvements in purity were also targeted and it was noted that the PUREVAP™ process can not only transform high purity quartz to high purity silicon metal, but can also transform low purity quartz (97.5%) to high purity silicon metal. The commercial implications of this are significant, as the prevailing proposition suggests that the quartz purity level required to make high purity silicon metal is over 99.5%(1). Also, it was noted that, the PUREVAP™ process could, produce high purity silicon metal in excess of 4N (99.99%) from a low purity quartz feedstock. (1) NI 43-101 Preliminary Economic Assessment on the Langis Silica Deposit and a Metallurgical Silicon Processing Plant in the Matapedia Region, Province of Québec, Canada. PEA study prepared by Viridis.iQ, GmbH in accordance with the requirements of National Instrument 43-101; "Exploring for silica in Quebec", SIDEX, Online report, http://www.sidex.ca/wp-content/uploads/2015/02/Exploring-for-Silica-in-Quebec.pdf, February 2015, Accessed on November 1st 2016. Q. Could you please explain the findings of the report announced today? The report essentially reviews the progress of Phase 2 - laboratory-scale testing for the scale-up of the PUREVAP™ process. 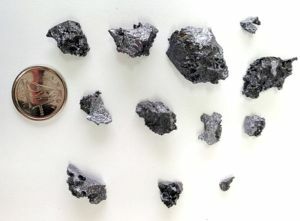 The final test of Phase 1 had produced small quantities (less than 0.1 g) of 3N+ (+99.9%) silicon metal from high-purity quartz (99.9+ % SiO2) as feedstock. Following this preliminary validation, PyroGenesis was mandated by HPQ to conduct additional series of lab-scale tests (Phase 2) to support the scale-up of the process to the pilot plant and increase the purity of the product. Quantity produced per batch has increased from less than 0.1 g to 8.8 g (test #32), nearly a hundredfold increase. Purity maintained at 3N+ and reached 4N+ while using a significantly lower purity feedstock (98.14 % or less instead of 99.9+ % SiO2). The lab-scale reactor capacity was scaled up by a factor of 3, maintaining the quality of the final product. The process now produces 3N+ silicon metal chunks and beads consistently and on demand. The operability of the process has been streamlined and improved, which is highly valuable for future tests. On the project management side, the project is on schedule to complete 40 to 45 tests by the end of January 2017. A total of 50 tests should be completed by the end of February 2017. While the focus until now was increasing yield, the next series of testing will be directed towards increasing product purity. Q. So by increasing the lab scale capacity by only 3x you managed to increase production yield by approximately 9,000%? A. Yes. It is an important step. It bodes well for scale-up. Q. All the while using low purity quartz as feedstock? Q. What are you targeting for product purity? A. Given these results, starting with low grade feed, generating 3N+ consistently and repeatedly, we believe that we have demonstrated commercial applicability to justify scale-up. We have recently reached 4N, however, the ultimate goal of testing is to produce solar grade silicon metal, which recently has been determined to be 5N+ (99.999%) purity(2). Q. What are your next milestones/target dates? A. Phase 2 is finishing up and is now on schedule for an end of February 2017 completion. By the end of this Phase 2, PyroGenesis expects to have conducted approximately 50 laboratory scale experiments. The data collected during this phase is being used for the pilot scale design, which is also occurring concurrently. "In conclusion, we are extremely pleased with the results to date," said Mr. Pascali. "Everything seems to be pointing in the right direction. So far we have achieved great results; some of which have never been achieved before in the industry. Our success to date in eliminating boron in one step and our ability to convert an inexpensive feedstock into a high purity silicon metal are just two examples of these unique successes. As previously mentioned, the next series of testing will be directed towards increasing product purity. Will there be future challenges? Most certainly. Will we be successful all the time? Absolutely not; there is significant risk and success is not guaranteed, however from where we are today, together with the results we are achieving, we are more and more comfortable that we are on the right track."